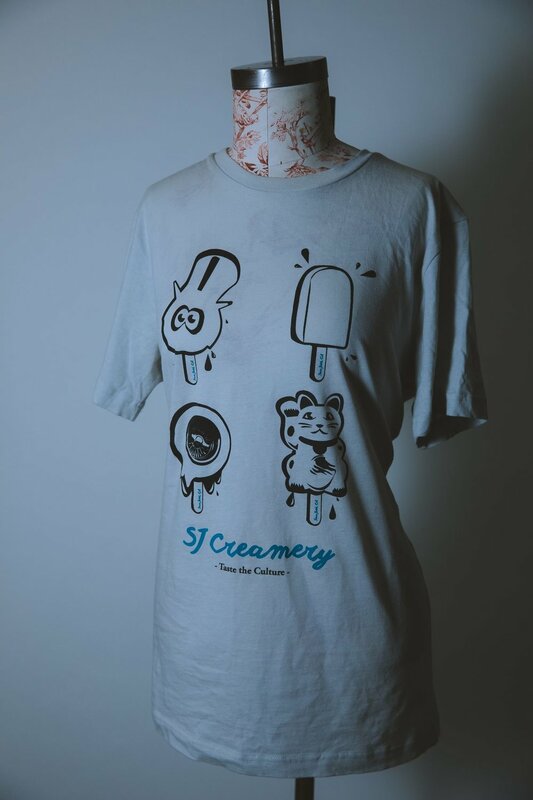 Welcome to SJ Creamery! Serving you a taste of the culture as we present to you our “NEW” paletas. ­Uniform in shape and mass-­produced, you can’t go wrong with these ice cream treats as they are the newest development for ice cream innovation that will be taking over our communities. 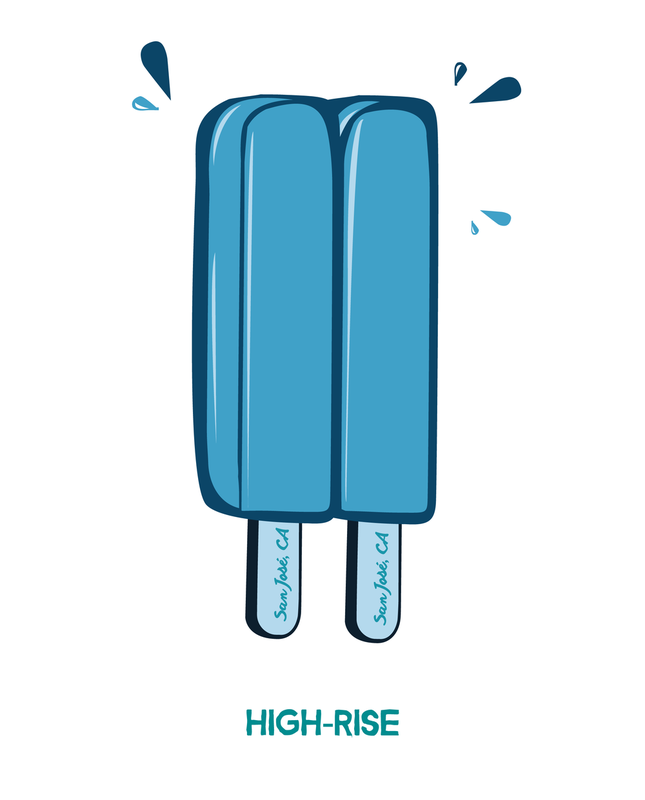 We have a lot of other paletas on the menu, but unfortunately, we have yet to find a way to alleviate the negative consequences that come with gentrification. So get them before they melt away! Just remember…whether you’re happy or sad, during good times and bad, until we can come together and take ownership, invest, and protect our communities…we can always count on a paleta, to eat our problems away. The lucky cat is a symbol for wealth and prosperity for households and businesses. With ongoing development to reach the ideals of urban city living, mom-and-pop shops as well as iconic San José establishments are quickly closing down due to the increasing rent that only tech and start-ups can afford. With many jobs being outsourced and rent increasing, residents are left with no choice but to move out and find work outside of San José in order to make ends meet. The flea is the mascot to the iconic Berryessa Flea Market in North/North East San José. It also represents the shift of employment from one consensus to another in the face of gentrification. Due to the development of the new BART extension to Berryessa, many small family businesses that make much of their livelihood at the flea market are at risk of displacement. For this reason, the paleta is melting. The chrome wheel represents the iconic culture of the Lowriders within East Side San José. This imagery was also meant to reflect culture, identity, and choice. Development will influence specific types of establishments that pop up, modes of transportation that exist, and will attract and cater to specific types of people. Unless you have old money or look a certain type of way, these new paved roads towards an urban city soon turn into “no cruising zones” for more than just lowrider cars. For this reason, the paleta is melting. The Guardian Lions take me back to Lion Plaza off Tully Road. Found guarding the entrances of the plaza and often seen in pairs, the Lions represent the balance between the feminine and the masculine – the yin and yang; they are the guardians that protect the structure inside and out. The female lion is often seen cradling a young cub under her paw, representing the nurturer of the soul as well as the protector of the people. The male lion is often seen resting his paw on top of an embroidered ball, representing the material substances, supremacy over the world, as well as the protection of the actual structure of a home. In the image, the Lions are separated as a statement of San José’s struggle to develop the the city around the needs of the community. With more conversation around placemaking and public will, it becomes apparent that the actions around development do not align with the needs of the San José residents as the imbalance can be seen through the number of unaffordable housing, homeless encampments, and even school districts closing down. The Jungle represents the continuing struggle for affordable housing in San José and how this struggle extends to the people and the environment. Considered as one of the “richest cities” in the United States, San José houses not only the best of tech, but also what was once considered to be the nation’s largest homeless encampment. The Jungle, before its dismantling, was tucked away and stretched across 68-acres along Coyote Creek. With a 72-hour eviction notice and little to no rehabilitation services, hundreds are left displaced and dispersed across San José. The expulsion and eradication of The Jungle can be considered as a shameful iconic time and image for San José. The push for sanctioned encampment programs and rehabilitation social services that will provide a safe place for the homeless to build for themselves with security as well as supply them with the chance for opportunity is urgent; it could be a stepping stone towards relieving the great number of homelessness, and in turn, shine light on the housing crisis. The Jungle is melting because even the most affordable last resort for housing has no guarantee of stability and safety from a 72-hour notice of eviction that punishes you for “trespassing” in a city you had always called home. In 2017, over 14,000 San José residents were impacted by the flooding of Coyote Creek. An estimated $73 million in damages was seen as preventable had it not been for the city, county and water district’s negligence to give early precaution and evacuate its residents in a timely manner. Many residents were made homeless and forced into tent cities due to the disaster. Still to this day, those residents are impacted by the flood with post traumatic stress of losing their homes and years of sentimental belongings. The High-rise represents the numerous high-rise projects that are popping up in downtown San José, and soon, its surrounding neighboring areas. Here, exclusivity and marginalization comes into play as locals are no longer able to afford to live in their neighborhoods as they are gradually being transformed into homes for the wealthy. Studies commissioned by the City of San José show that for every person who can afford to live in these high-rises, 2.8 employees of minimum wage jobs are needed in order to cater to and up-keep their lifestyles. Unfortunately, these minimum wage workers will never make enough to afford to live in these high-rises that only serve the wealthy. The High-rise stays intact and unaffected because San Jose’s prosperity only benefits a select few, while the majority of its locals can barely afford to call San José home. La Raza tells a story of the erasure of Mural de la Raza. This moment had left the community in emotional distress as it is clearly another sign of cultural erasure due to gentrification. This iconic mural was painted by artist José Meza Velasquez and depicts the histories and culture of the Chicano Movement, Mexican Revolution, and important historical figures. However, overnight the mural was unlawfully painted over by property owners. With fear of displacement, community members band together in a coalition to demand the restoration of the mural and as well as implementation of Chicano studies in schools. Unfortunately, this is not the first incidence of a cultural mural being erased. We will only see more of these incidences happening as long as San José continues to place business interests above the interest of the cultural community.